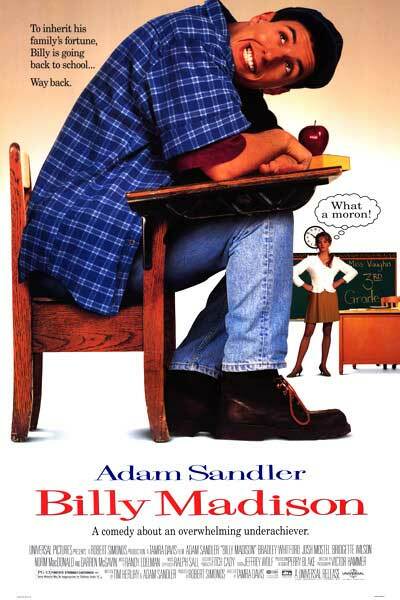 I started my last nursing pre-requisite class yesterday, and let me tell ya…this is gonna be a looong six weeks. I’m still getting used to my new schedule, so please forgive the lack of posts thus far! 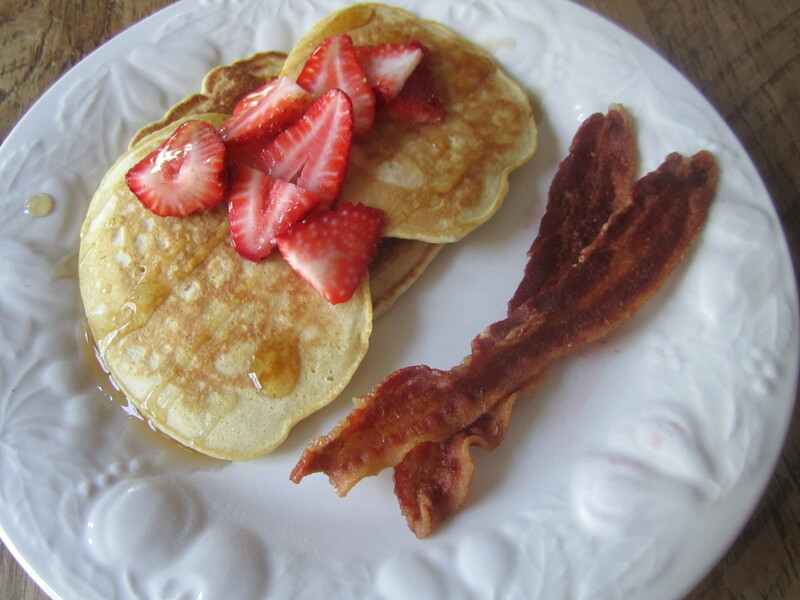 On Sunday, I made a batch of Fiber One pancakes, topped with fresh strawberries and sugar-free syrup. I noticed some bacon in the fridge that looked like it needed someone to eat it, so I volunteered. On Sunday, my little sister, Lauren, was driving back up to Tallahassee for school from Ft. Lauderdale. She stayed the night at our house, and I took her to breakfast at Einstein’s the next morning. 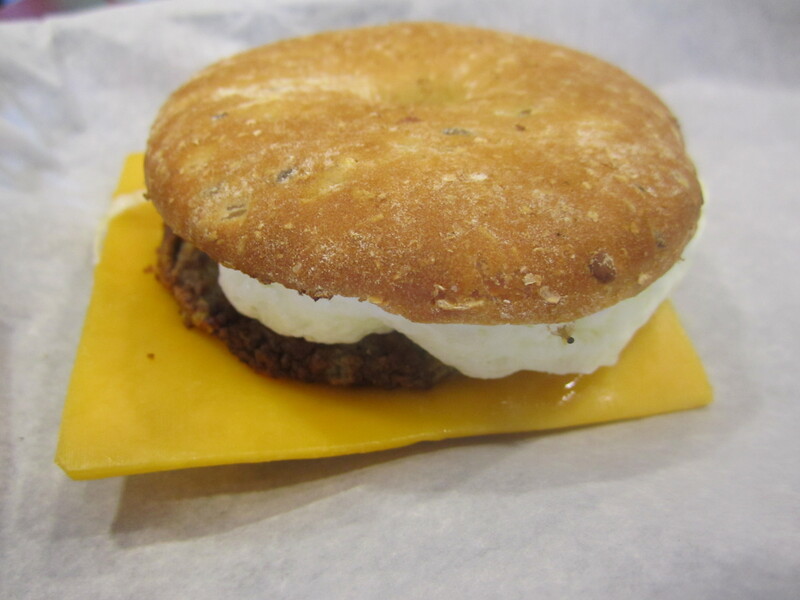 I went with a whole wheat bagel thin topped with eggwhites, turkey sausage and a slice of cheese. Yesterday’s lunch was a little something I like to call, grab-whatever-you-see-and-stuff-it-in-a-pita. 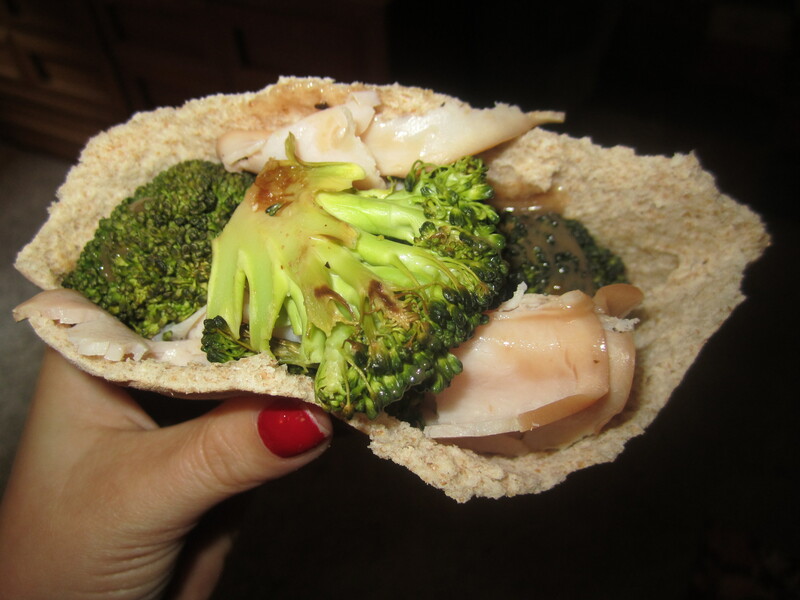 I heated up some leftover roasted broccoli and put it in my pita, followed by deli turkey and a drizzle of balsamic vinaigrette. Not the best tasting thing I’ve ever created, but it worked for the time crunch I was under! Our dinner last night was a mini fiesta! 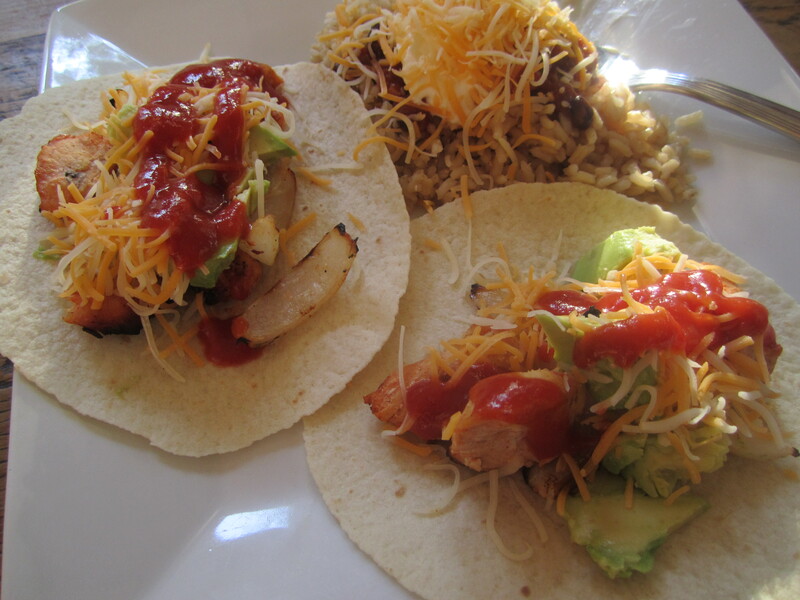 Corey grilled some sliced chicken breasts and 1 large onion, all mixed in taco seasoning, while I prepared some brown rice and taco toppings. I had two soft tacos topped with avocado slices, salsa and a little cheese. I also topped my brown rice with salsa and cheese, for extra flava. I love me some Mexican food! Stay tuned tomorrow- I’ll be revealing pictures from me and Corey’s engagement photoshoot! Tuesday was a busy, busy day! 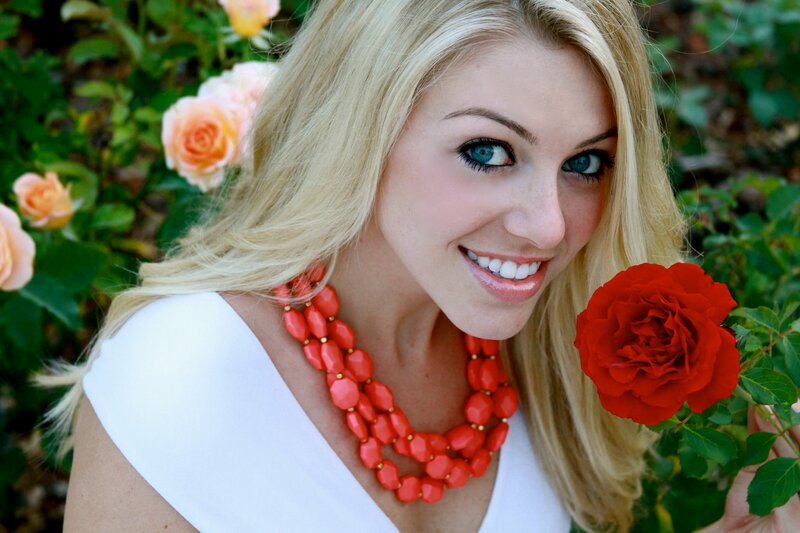 My “big sister” in my sorority, Jessi, was in town visiting and doing some photography for people. She asked if I would be her model for the day, which I quickly agreed to! We ended up spending all of Tuesday together- from 6AM to 8PM- taking pictures throughout the day, stopping for meal breaks, and enjoying catching up with each other. The pictures I’m the most excited about seeing just happen to be our ENGAGEMENT PICTURES! Yep, that’s right- I actually got Corey to pose for corny-yet-adorable pictures with me. Most people get these kinds of pictures taken right after they get engaged, so, we’re a little late 😉 . As soon as Jessi sends me the final products, I will dedicate a post just for the pics. This little sandwich is part of Einstein’s new Eggwhite Bagel Thin breakfast options– this particular one had 290 calories. It included eggwhites, the mushrooms, asparagus and swiss, and also, a roasted tomato spread, all on a whole wheat bagel thin. 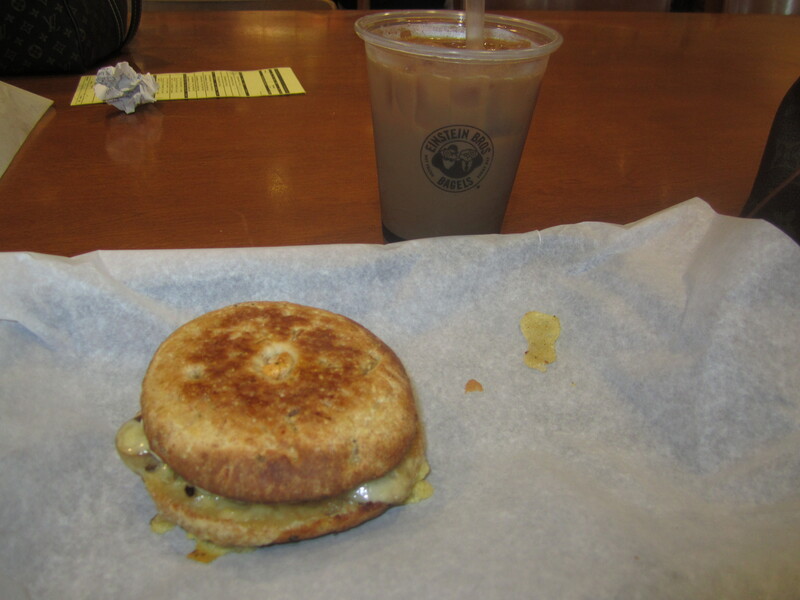 I also enjoyed an iced coffee with skim milk on the side, which I am now addicted to. For the main event, I had the Tuna 3 Ways lunch special. 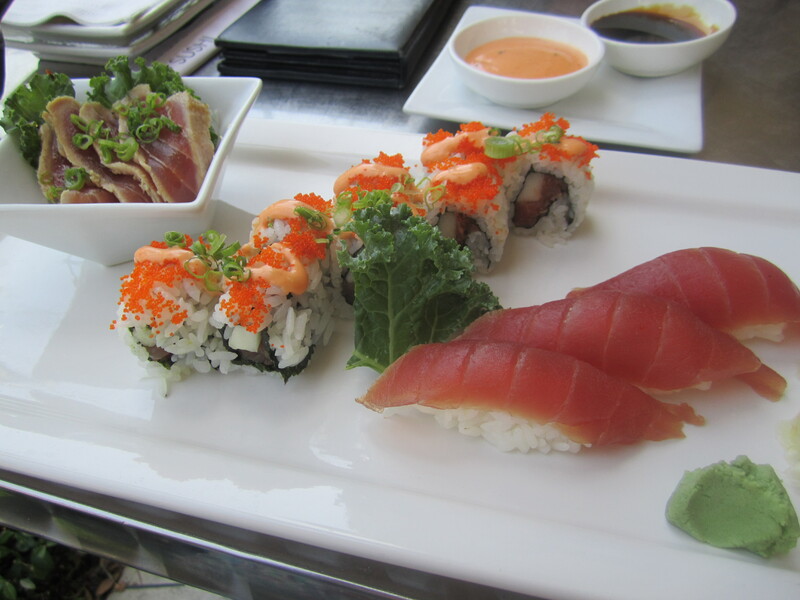 It included 4 slices of Tuna Tataki, a Spicy Tuna Roll, and 3 pieces of tuna sushi. Good thing I love tuna! When Corey and I finished taking pictures (I can’t WAIT to show them! ), we came inside and he heated up the grill. He placed 2 pork tenderloin kabobs with tomatoes, onion and green pepper, on the grill for a few minutes, until they were nice and crispy. 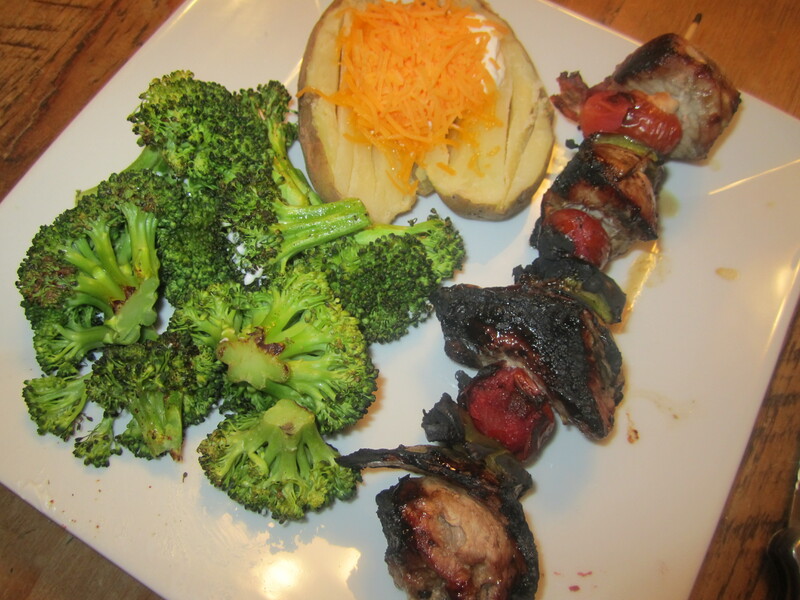 We also had roasted broccoli and a small baked potato with a little sour cream and cheddar cheese. After covering Wednesday, I will be all up-to-date with my posts. Finally! Today’s breakfast was pink. In my opinion, everything should be pink. 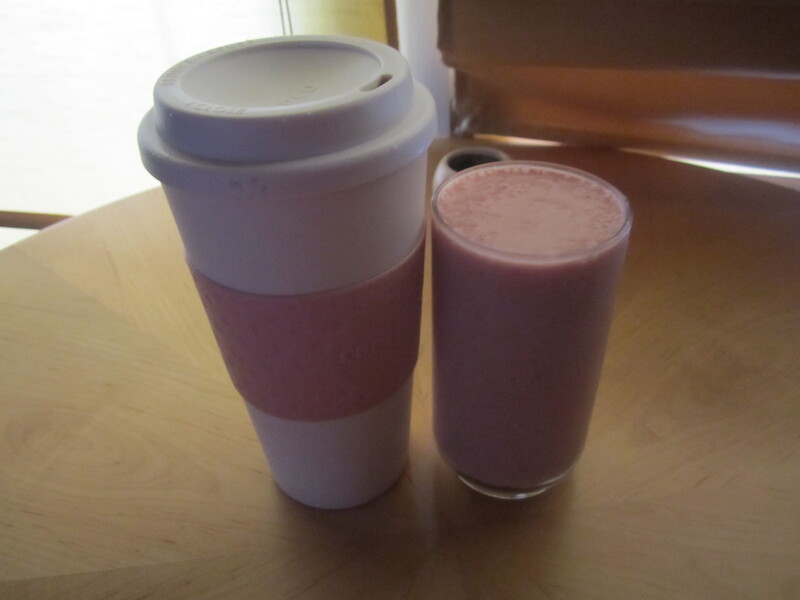 I had a strawberry banana smoothie, alongside a thermos full of hot coffee. Somehow, our protein powder got lost in the move, so the only protein in this baby was some Greek yogurt. After working on my nursing school application and other tasks on my to-do list, I took a break and headed to the gym. I had a massive headache, and I really didn’t feel like going, but I thought I might feel better if I got in a little sweat sesh. I started on the elliptical for 20 minutes, before hopping on a treadmill and completing a random mix of running, walking uphill and intervals for 25 minutes. 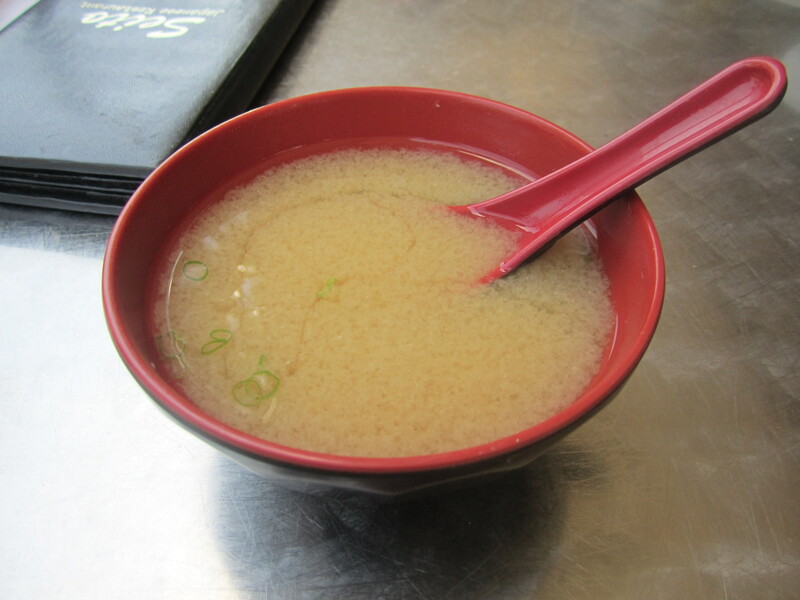 My headache felt slightly better, but I realized it had been hours since I ate anything, and that was likely the cause. 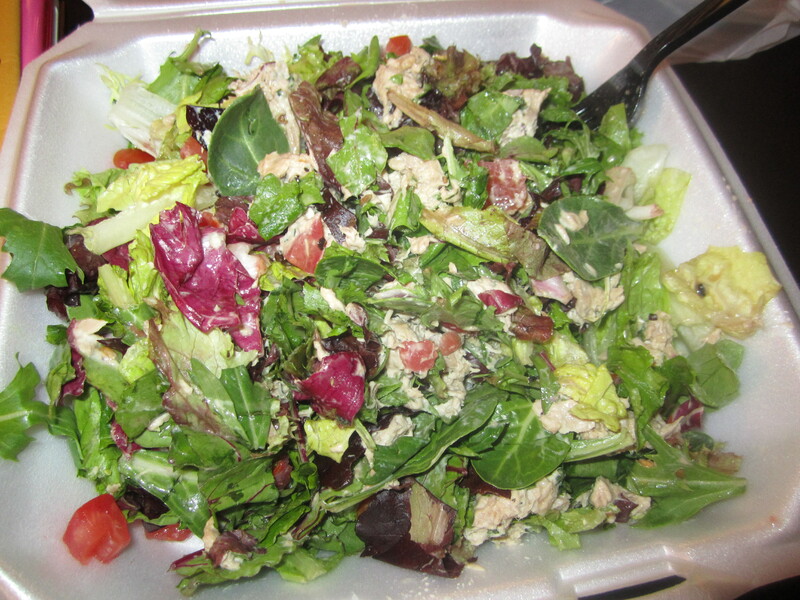 I guess my new favorite post-gym lunch is the tuna salad from Green Lemon Cafe! This salad is simple- it’s just spring mix, a few tomatoes, and maybe 2 slices of cucumber which I don’t eat, topped with their tuna- but it is so good. This time, I ate every bite 🙂 . Corey and I had planned to cook dinner together, however, a quick text from his mom changed our plans! They said they wanted to take us to Jimmy Hula’s for fish tacos- say no more! We’ve been to Jimmy Hula’s once before, but it was even better this time around. 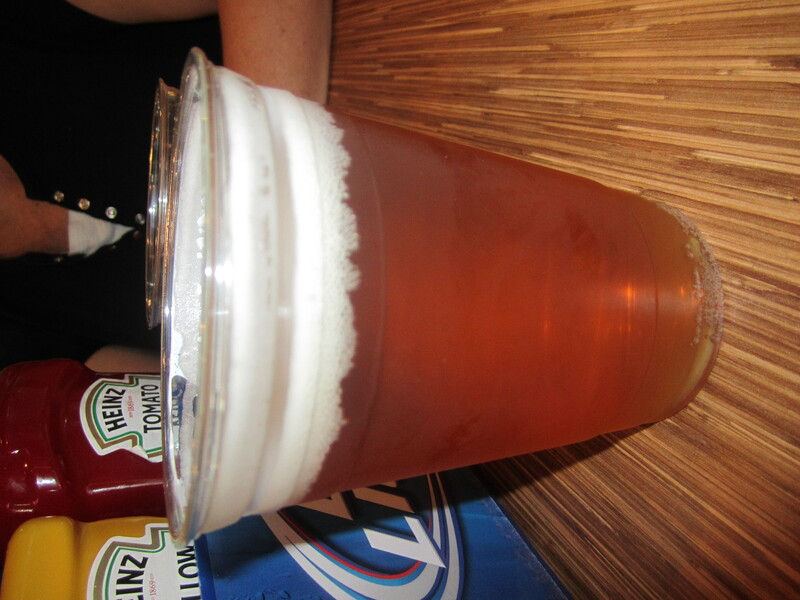 I noticed that they had Orange Blossom Pilsner on tap, so I just had to order one. 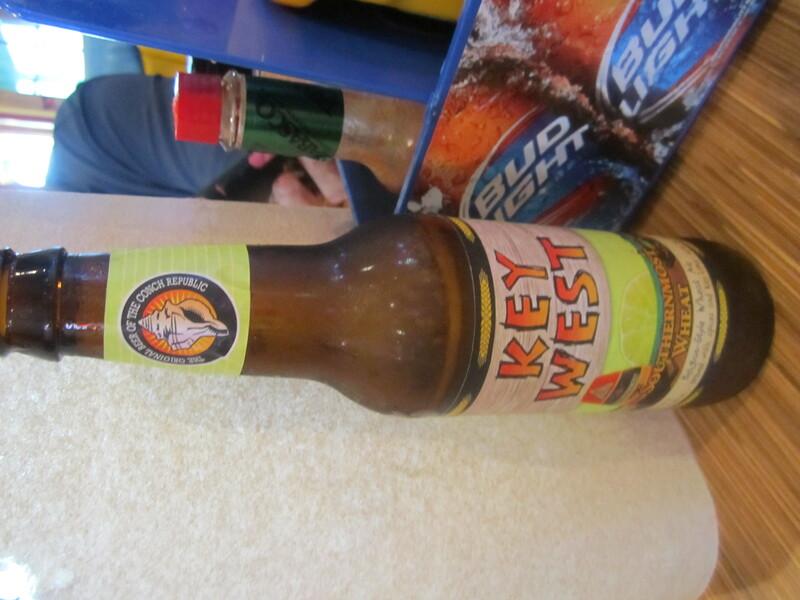 Corey ordered an interesting beer- I mainly liked it due to the cute and colorful label, but I didn’t tell him that. 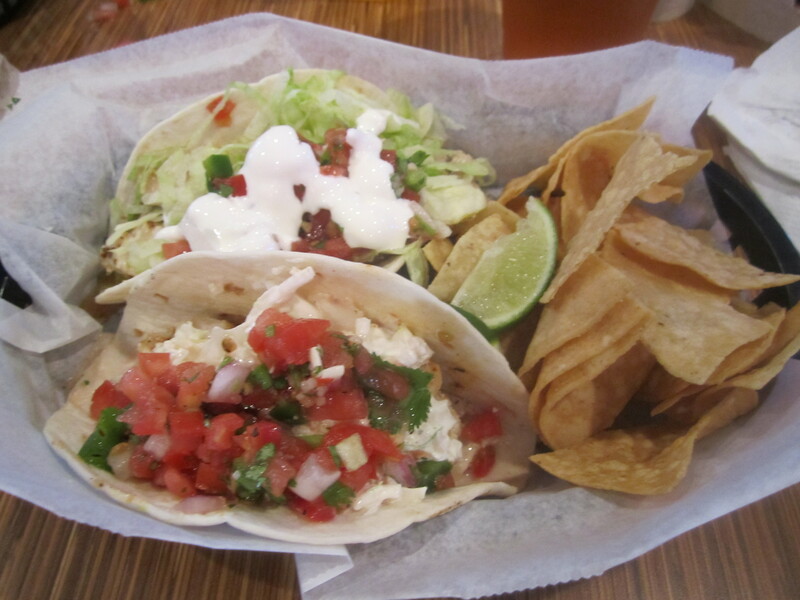 For my meal, I ordered one Epic Cali Fish Taco, which was topped with cabbage slaw and pico de gallo, and a Malibu Fish Taco, which included guacamole. I ordered both grilled, instead of blackened or fried, and I also scraped the sour cream off, to save a few cals. Both were flavorful and very filling, plus the fish was cooked perfectly. We will be back, Jimmy!